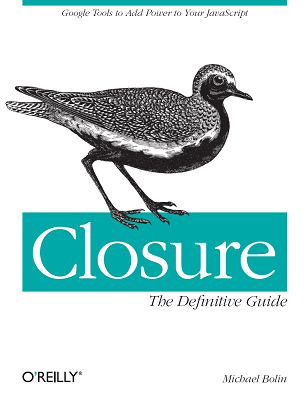 On Monday, I submitted my manuscript for Closure: The Definitive Guide to O'Reilly for copyedit review. The past two months of revisions were extremely stressful, so I can't even begin to describe what a huge relief hitting that milestone has been for me. Honestly, I thought the draft was in reasonable shape when I finished it back in May, so I ended up doing a lot more work than I expected to get it into a state suitable for submitting for copyedit. Detailed example of dividing compiled code into modules and loading them with the Closure Library (appears in Chapter 12). Rewrite of the complex component example at the end of end of Chapter 8. More hidden options in Chapter 14, which has been renamed to "Inside the Compiler." An explanation of goog.events.KeyHandler in Chapter 6. A section on goog.Uri in Chapter 7. A section on mock objects in Chapter 15. A new appendix on plovr (appears as Appendix C). As part of the revising process, I (with the help of contributing author, Julie Parent) responded to all 100+ comments made on the Rough Cuts web site, which were a big help in improving the quality of the draft. Thank you so much to everyone who contributed so far! (Special thanks to Derek Slager, who filed the overwhelming majority of the corrections.) As the manuscript has not been finalized yet, you can still submit feedback now to help improve the final version of the book, so don't be shy! For the next month or so, the manuscript will bounce back and forth between O'Reilly and me. According to Amazon, my book will be out on September 15, 2010, though I think that may be a little optimistic. Fortunately, the beauty of Rough Cuts is that you don't have to wait until the fall to get the help you need with Closure today!